Labels: almost as good as snail mail? Really cute post. I always wonder about the voices of fellow bloggers. I never considered not seeing their handwriting. I know what your handwriting looks like! Nice to see it hasn't changed. 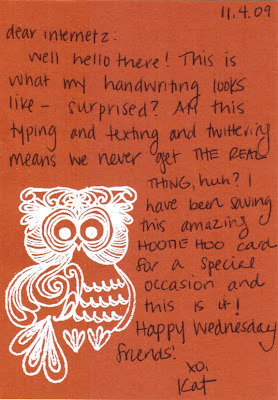 ;-) Um, that hootie card is precious. Where can I find more?? ?